In/Visible Fields day dreaming conversations took place while walking together on the estates, in people’s own homes, and on a wintry day trip to a Suffolk greenfield (care of Top Boy Bakers’ partner E5 Bakehouse); Here an intergenerational group of 14 from The Sunken Garden Community Orchard gardeners and Top Boy Bakers’ mentors, took part in permaculture composting on an epic scale, sharing food and walking the field together, all the while exploring multiple ideas about day dreaming. Drawing upon the shared musings of these shape-shifting conversations, the artists created films and sound-works from film / photography, sound footage, and the participants’ In/Visible Fields personal day dreaming diaries. In/Visible Fields links 3 sites: the pram sheds on Attlee Terrace, The Sunken Garden on Prospect Hill and both onto and inside St Mary’s Church, Walthamstow that sits on the threshold between The Drive & Attlee Terrace housing estates & Walthamstow Village, a conservation area in E17. 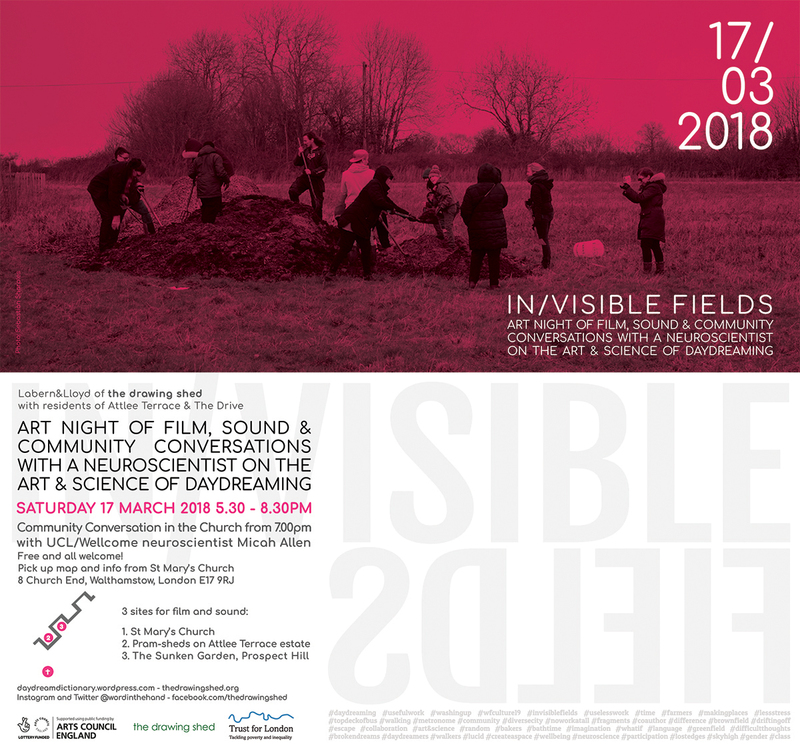 On Saturday March 17th, 5.30-8.30pm, In/Visible Fields will present a single Art Night of film projections and sound, alongside community conversations hosted by the artists with UCL / Wellcome Neuroscientist, Micah Allen in St Mary’s Church from 7.00pm. Playful, engulfing, dystopian, human centred, provocative and generous, we welcome you to join us! The artists have asked the questions: do we day dream differently when doing useful work, ‘useless work’ or no work at all and who defines these things? How do language and culture impact on the way we day dream – Polish, Somali, Turkish, English, Tamil, Spanish…? And what about the impact of early formative experiences? Or do our particular memories trigger new spontaneous narratives? Do very personal visual triggers send us off on our own ‘inner verbal mappings’? And what about gender and class? In contemporary Britain where we are busy working and studying ever harder, do these wanderings of the mind allow us to rest, keep us sane? are we more creative in our thinking if we make time for drifting? is daydreaming discouraged because we can take risks, make new worlds whilst no one is looking? do we take shelter from difficult experiences, in an unstructured, fluid and imaginary space? do we release boundaries in this most unique of human spaces and raise expectations? and does this impact the way that, with the mind and the body together, we then think about how another, changed world might just be possible? The Day Dream Dictionary is a work by the writer Mary Paterson, commissioned by the drawing shed, as a ‘call and response’ to In/Visible Fields. The Day Dream Dictionary is part-investigation and part-intervention into the themes and experiences of In/Visible Fields. Here, the writer Mary Paterson responds to the ideas and practises raised by the project, as part of a growing piece of field research.